Port Arthur is officially Tasmania's number one tourist attraction, and no visit to the state is complete without seeing it. Port Arthur was established as a convict settlement and soon became Australia's largest, in operation from the 1830 until 1877. Guides interact with visitors, and although there are static displays, visitors are encouraged to explore various features of the ruins, helping to give them a sense of what life was like in 19th century Port Arthur. The penitentiary (above) can be toured, as can the model prison, where convicts were forbidden to talk or set eyes upon each other. 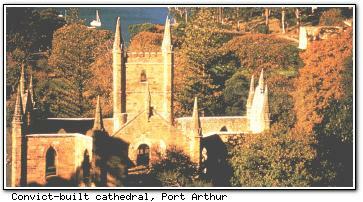 The ruins of the church (below) are also in the Port Arthur Historic Site. During the day, many visitors stop at the Tasmanian Devil Park in nearby Taranna , where the Devils are fed at 11 am daily, and other native animals and birds (wombats, quolls, eagles) can be seen close-up. The Bush Mill is another popular stop, with its historic timber mill, settlement displays, and steam railway. There are nightly ghost tours to the convict ruins, and it is possible to cruise to the Isle of the Dead. Port Arthur is a 90 minute drive from Hobart, but visitors are well advised to stay overnight on the peninsula. Both quality accommodation (four 4-star and two 3½-star, RACT rated) and camping facilities are available.